On average, 60 million photos are shared every day on Instagram, gathering 1.6 billion “likes”. So far, some 20 billion photos have been uploaded on the site. Instagram’s growth was helped along by its extension to Android systems; and fortunately its acquisition by Facebook in 2012 for $ 1 billion (the exact purchase price was $300 million in cash, and 23 million shares) did not slow it down as some had feared. Facebook (wisely) stepped back and let it remain independant. It is conservatively estimated that Instagram has at least 100 million active monthly users, a figure that places it right behind Twitter, which has recently disclosed that it has some 115 million active monthly users. In its ascent, Instagram suffered a hiccup in December 2012 when it updated its terms of services and granted itself the right to sell photos to third parties (i.e. advertisers) without compensation to the photo owners. This didn’t go down well with the National Geographic or celebrities like Kim Kardashian. 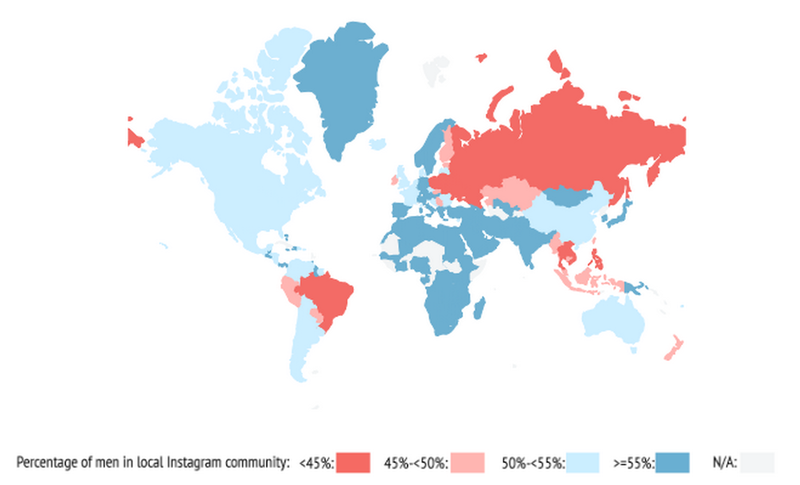 Instagram lost users, some said up to 25% but others denied it (see here); the main beneficiary appears to have been Flickr but only for a short time. Overall, Instagram’s growth has been exponential: from15 million users after only one year of operation to a reported 200 million three years later, by end March 2014 (the most recent available data). That sort of growth is unique, it has displaced Pinterest for good and it looks like it’s ready to overtake Twitter. Everyone says it’s because of the kind of audience Instagram draws in: mainly women and mainly teenagers. Conventional wisdom has it that women are more “visual” than men and teenagers don’t read or write. They are only attracted to images, and that’s what Instagram is all about, images! 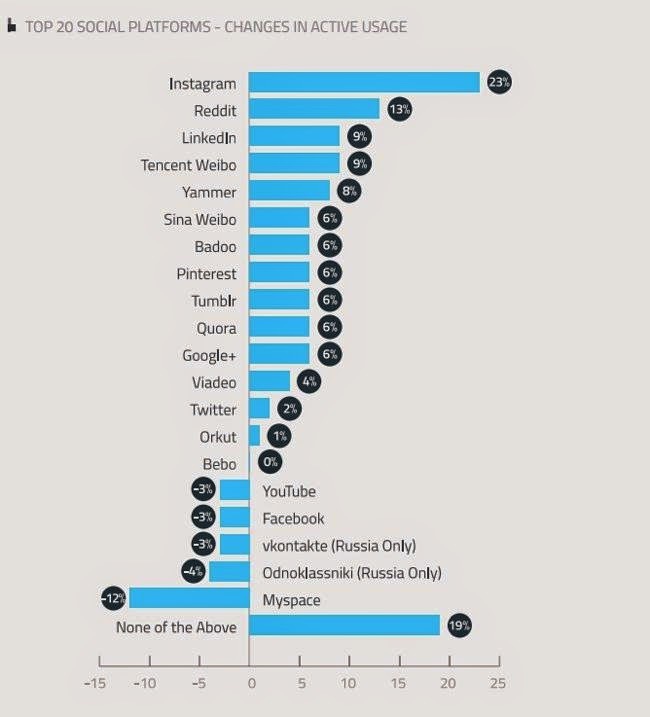 Second, the business about teenagers.Everyone recalls this surprising statistics: 42% of US teens (13-17) use Instagram on their mobile devices, and Instagram is tied with Facebook as the most important platform used by teens, right behind Twitter. All these numbers go back to September 2013. But if you confront this with another set of data: that 90 percent of users are under the age of 35 and a lot of them with college education, upwards of 23%, you realize that not everyone on Instagram is a teenager.Indeed, every generation is increasingly drawn in, including Baby Boomers, with a reported 18% of the 30-49 age group using Instagram. Notice something? 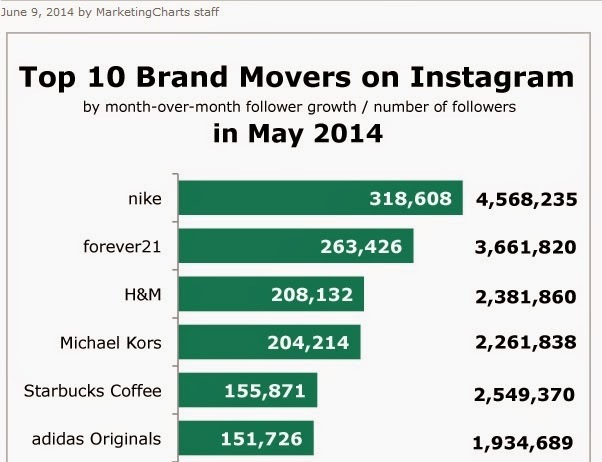 Brands are moving up faster on Instagram than on Twitter, by much larger numbers (the difference is of the order of 50,000 followers or more) and at least one (Nike) is clearly doing better overall on Instagram. 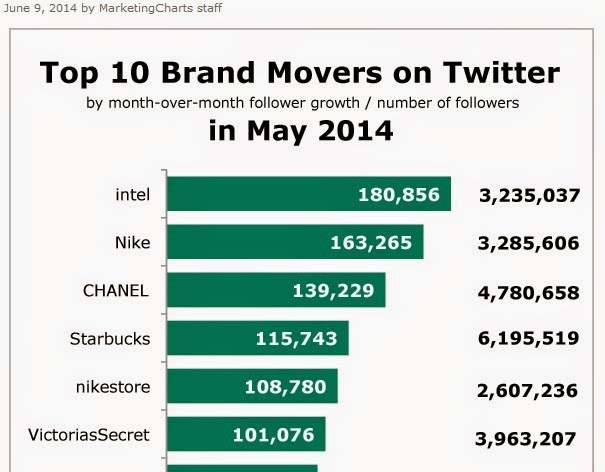 However the users with the largest following are not brands, they’re celebrities. Rihanna: 10 million vs. 36 million. The millions are there but Instagram still has a way to go before catching up with Twitter! Yet it’s moving very, very fast: consider that Justin Bieber stood at some 12 million only 5 months ago, in January 2014 – he’s adding a million or more every month. My prediction? Instagram will overtake Twitter and zip into first place by the end of this year – assuming there are no major hitches, like the one about selling photos to third parties or blocking hashtags pitching sales of marijuana and the like (something Instagram had to do in response to a BBC investigation in October 2013 that discovered the platform had been used to sell illicit drugs). Why do I feel so bullish about Instagram? Mainly because our culture is becoming ever more visual. Marshall McLuhan‘s famous 1960s observation that “the medium is the message” now means something very concrete: the picture is the message, not the written word. And Twitter, with its famous 140 characters limitation, has based its success on word plays. It’s a challenge to come up with something meaningful in 140 characters – it’s much less of a challenge to upload a pretty picture, particularly when the service has come up with neat technical gadgets that instantaneously turn an unexceptional picture into an arresting one. Plus, from an advertising standpoint, photos speak much more than slogans, even the best crafted sentences cannot be as striking.Visual artists are keenly aware of the use that can be made of pictures. Not unsurprisingly, this did not succeed in lowering prices, with one piece recently selling for nearly $6 million. There are other limitations on Twitter that don’t exist on Instagram: you can throw in as many hashtags as you wish and make your descriptions as long as you like – so your chances to reach out to a lot more people are much greater. And compared to Pinterest, there is a far greater interaction between users. Pinterest provides you with boards to pin your pictures, it doesn’t make it easy to share them. To see someone’s pictures on Pinterest you have to visit their boards; on Instagram, you don’t have to do anything, they are thrown at you (provided you follow them, of course, and use hashtags). In short, Pinterest is no rival to either Instagram or Twitter. 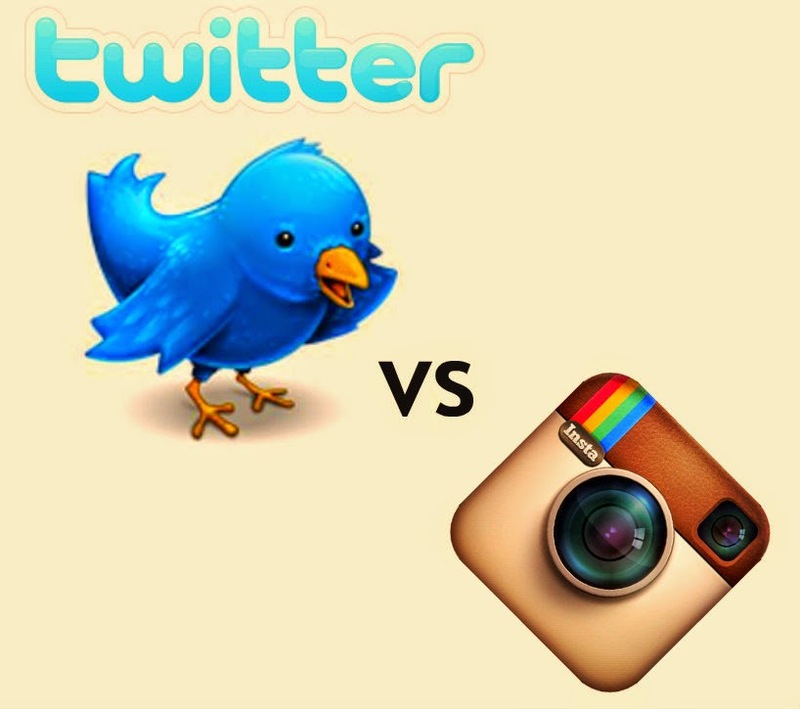 Does this rise of Instagram spell the end of Twitter? I don’t think so. Twitter remains a top messenger platform if you actually have something to say of use to your followers: this is why Twitter has proved so politically important during the Arab Spring street protests. People were tweeted into going to specific places at specific times to participate in specific public events and manifestations. That’s not something Instagram can easily do. It has set up a messenging service, but its primary function remains photo sharing, and it can’t get out of it. Twitter of course has also added a photo-sharing function to its service, but it’s not half as easy to use (it requires separate motions to add pics) nor so much fun (Instagram provides you with the gadgets to instantly photoshop your photos. In fact, no matter how hard each platform tries to diversify and enter into functions covered by rivals, the fact is that the way the platform is born is what defines it. Facebook is what its name implies in the American school culture: a place to post your name, your face and your achievements; Twitter is a way to send out messages in short bursts (tweets); Instagram is a way to share instantaneously what you see (photos and now videos, up to 15 second clips). And with literature and book reading giving way to watching TV series like House of Cards or Breaking Bad as a preferred way to entertain ourselves, how can anyone doubt that we are fast moving towards a pictorial society? Once again Claude has her fingers on the pulse of social media. And I’m glad she’s willing to share that info with us because I’m one of those who is still trying to keep my head above water in conventional outlets such as Facebook and Twitter, and only occasionally succeeding. Thanks for another informative article. Thanks, Bob, I try! I began looking around because I’m getting more and more dissatisfied with the “traditional” social media (Facebook and Twitter), neither are environments particularly supportive of writers and artists – probably the exception is YouTube (being more visual, it is a little like Instagram). I noticed it is far more supportive, and there’s no question that the more successful “hybrid” authors, for example Hugh Howey of WOOL fame, are on YouTube – I remember seeing Hugh Howey sharing with readers his delight when he got a first proof from Create Space of his printed book and then later, a crate of printed books for distribution at some book event…It was a very home-made video but it worked, it brought the guy closer to you!